Resources and the buildings that produce them are vital to your survival in Vikings: War of Clans. You will need them to construct and upgrade buildings, learn new Knowledge, and train troops. In this Resource guide, we will break down the key buildings that produce the five vital resources that both your army and your Town need to in order to flourish. In addition, we will delve into what each of these resources does and how you can acquire them not only from within your own Town, but out in the wild, untamed lands of your Kingdom. Unsurprisingly, there are five buildings that allow you to produce these resources without having to venture outside into the brave, dangerous world of Vikings: War of Clans. To produce more resources, you need to construct enough resource buildings and constantly level them up. Without a solid mix of these buildings, you will have a difficult time advancing yourself in the game. Therefore, it is vital that you have several of each building and always strive to improve their level, thus increasing production capabilities of each resource. 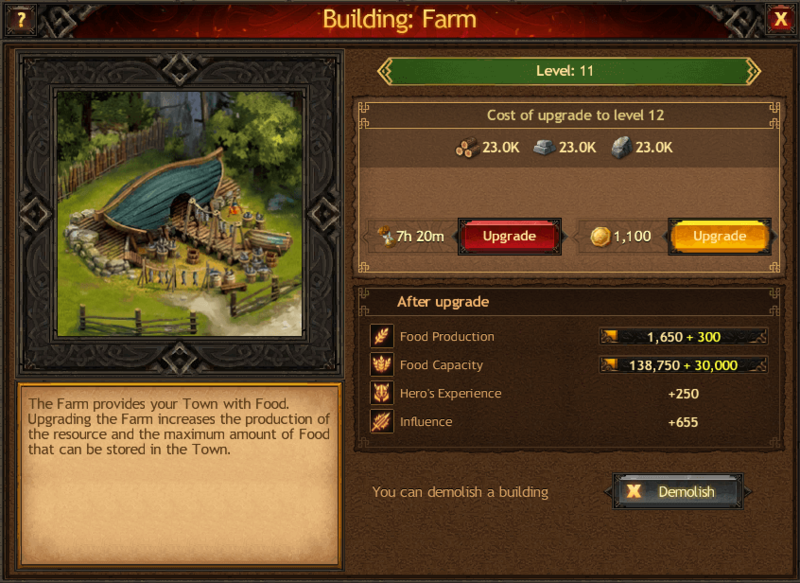 The Farm provides your Town with Food, one of the main resources in Vikings: War of Clans. Food is used for troop upkeep, constructing and upgrading of buildings, training new warriors and learning Knowledge. Increasing the level of your Farm will increase Food production per hour and the total Food storage capacity of your Town. If your troop upkeep exceeds your food production capabilities, your food will slowly deplete until you run out completely. When your Food storage hits zero, your troops won’t die of starvation, but you won’t be able to train new warriors, upgrade specific buildings or learn Knowledge. Luckily, you don’t need Food to level up a Farm, so it is always possible to upgrade this building and increase Food production. The Lumber Mill provides your Town with Lumber, one of the main resources in Vikings: War of Clans. It is used to build and upgrade various buildings, train warriors and acquire Knowledge. 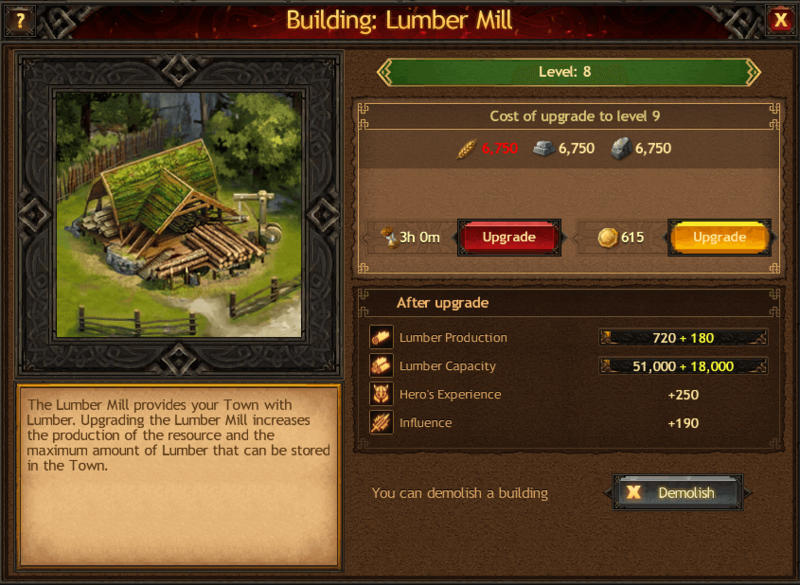 Leveling up your Lumber Mill increases your Lumber production per hour and the total Lumber capacity of your Town. When you reach the capacity limit, Lumber production will stop. Once your Lumber supply drops below the capacity limit, your Lumber Mills will start producing it again. The Mine provides your Town with Iron. Like the other basic resources in the game, Iron is used for training new troops, constructing more buildings and learning new Knowledge. 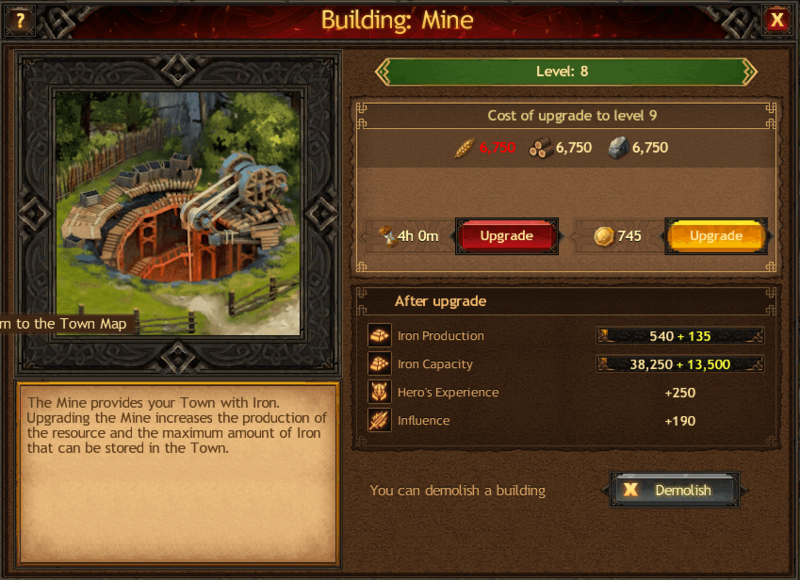 Upgrading your Mine will increase your Iron production per hour, and your Town’s overall Iron capacity. Once you reach the Iron storage limit, your Mines will stop producing new Iron. Once your Iron supply drops below the capacity limit, your Mines will start producing again. he Stone Quarry provides your Town with Stone, one of the main resources in Vikings: War of Clans. It is another crucial resource for constructing and upgrading building, learning new Knowledge and preparing more troops. Increasing the level of your Stone Quarries will increase your Stone production per hour and the total Stone storage capacity of your Town. When you reach the capacity limit, Stone production will stop. 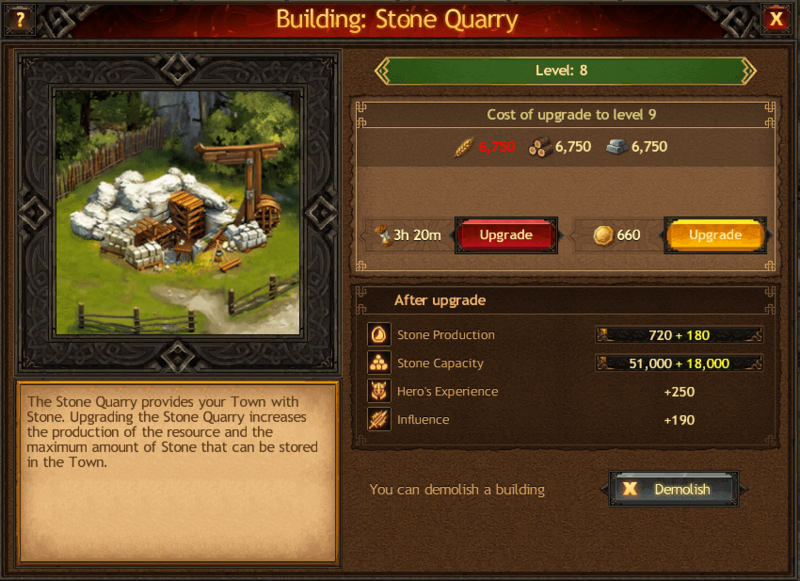 Once your Stone supply drops below the capacity limit, your Stone Quarries will start producing it again. The Manor produces Silver — the rarest resource in Vikings: War of Clans. It is mostly needed to learn new Knowledge, though you need it for troops and buildings and other important processes in the Town. 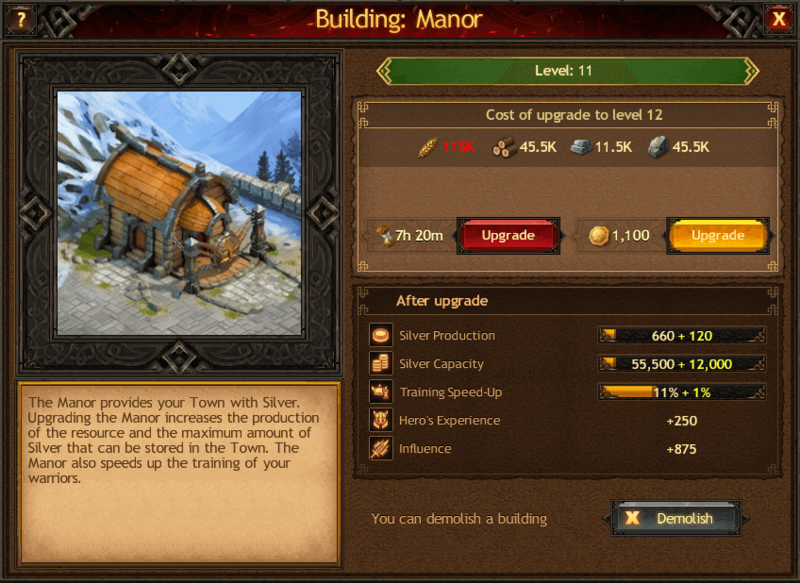 Upgrading a Manor will increase Silver production per hour and your Town’s Silver capacity. In addition, it will also improve your troops training speed. By having multiple Manors you can quickly create a large army. It’s important to note that the Barracks only allows you to train more warriors in a single batch and does not affect their training speed. All resource buildings can be upgraded up to level 31. The amount of resources and time needed for an upgrade increases from level to level. In addition, you must increase the level of your Town’s Palace in advance of increasing the level of a resource building. For example, to increase your Stone Quarry to level 21, your Palace must first be level 21. 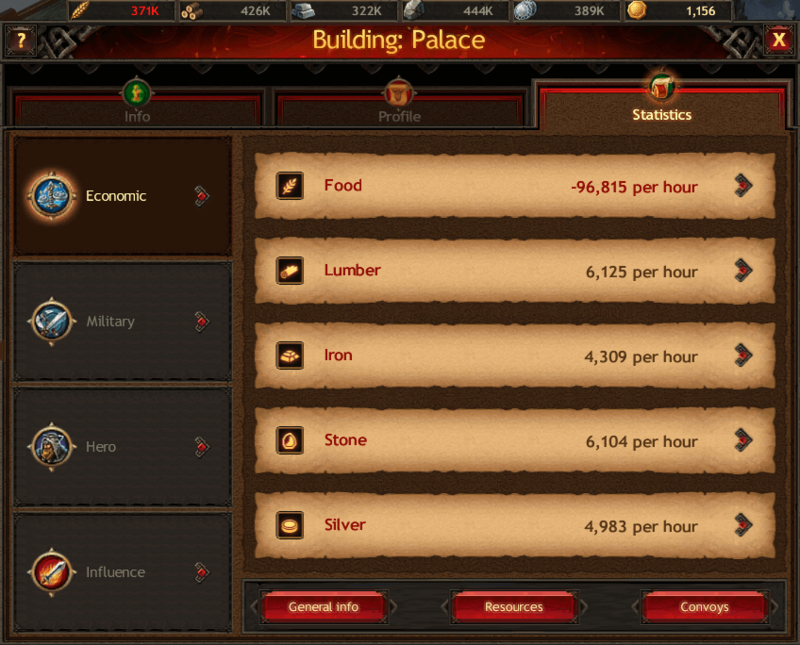 The Palace is also a good place to keep track of your resource production. You can see how much of each type of resource you are producing per hour in the Statistics tab, Economic section. You can diversify and construct as many resource buildings as you wish within the limits of the predetermined slots in your Town. This means that you don’t need to have an even amount of each type of building. If you want to focus on one or two specific resources you or your clan might be in need of – you can. At a later stage, advanced players tend to create one of each resource building, and then dedicate the remainder of their slots for Farms. You can diversify the number of buildings depending on your tactics and playing style. Resource buildings are not the only source of resources in Vikings: War of Clans. You can also attack resource locations or other players’ Towns on the Global Map. 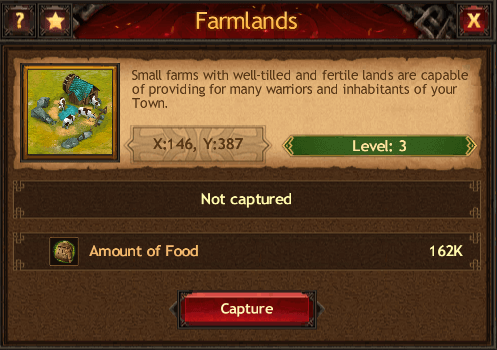 The screenshot above is an example of a Farmlands resource location, which you can capture to increase your Food supply. To acquire Iron, Lumber, Stone and Silver, you need to attack Iron Deposits, Lumberjacks’ Shed, Hewers’ Camp and Silver Altar respectively. Please note: you are vulnerable while you gather resources, and other players might attack you at these locations. Below you can see the example of the window that opens when you click on another Player’s Town. 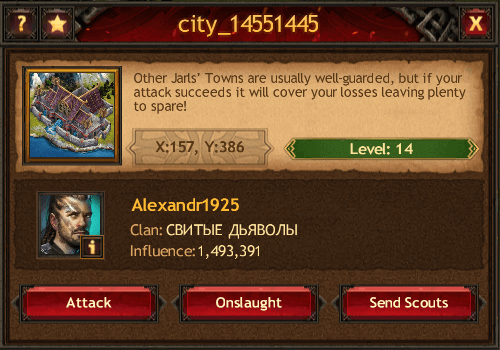 Be careful when attacking other Towns on the Global Map: the players you’re attacking can fight back. All resources, no matter how you choose to acquire them, are equally important and vital for your gameplay and eventual rise through the ranks. You will need them to improve various buildings within your Town, including your resource production buildings themselves, troop production and Knowledge advancements. Gathering, acquiring and managing resources is a key part of Vikings: War of Clans. Every Jarl must master these skills if they want to survive in the harsh North. Get out there, develop your strategy and take action – untold riches await you. Play Vikings: War of Clans NOW!